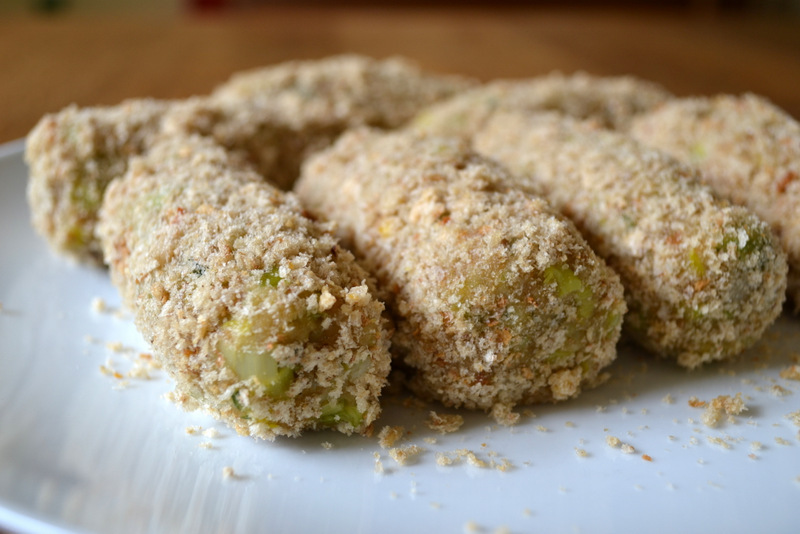 The Glamorgan Sausage, or Selsig Morgannwg, is a traditional vegetarian Welsh sausage which contains two very Welsh ingredients; Caerphilly cheese and leeks. It seems that they used to be made using Glamorgan cheese, but such a thing is no longer available, though it is reportedly very much like the creamy Caerphilly. If Caerphilly cheese is not available where you live fear not, mature cheddar cheese or something a little creamier will do just fine. Besides, it’s the breadcrumbs that really hold these incredibly tasty sausages together. I can’t believe this is only my fourth post in the ‘Keeping Alive Tradition’ Series. However, I’ve recently come into possession of a book about traditional Welsh food, so it should provide me with a little more information and a modicum of inspiration. It may surprise you to discover that Wales has an extremely rich culinary history; we’re world famous for cockles, seaweed, lamb, beef and many other foods besides. Perhaps I’m a little biased, but I think Welsh food must be one of the most underappreciated cuisines in all the world, notwithstanding the well-known ‘bara brith’. If you’re interested in seeing the other recipes from this series you may find them all HERE! Despite the relative simplicity of these sausages, their flavour is really rather impressive; Caerphilly cheese and leeks combine to make a particularly stunning sausage. Indeed, these cylindrical joys aren’t for the faint of heart or tonsil – I’ve witnessed more than one leek eating competition in my time. Still, if you’re looking for a delicious, sumptuous and almost decadent vegetarian sausage, you can’t go far wrong with these beauties. 1. Fry the leeks for 8-10 minutes with a little oil, salt and pepper. Once they have sweated right down transfer them to a large mixing bowl. 2. To the leeks add the cheese, breadcrumbs and egg yolks. Use 130g of breadcrumbs at first and add more if necessary. This mixture should form a very stiff dough. Shape the dough into seven or eight sausages. Dip each sausage in the egg whites before coating in bread crumbs. Pop them in the fridge for 30 minutes to firm up. 3. Heat a little olive oil in a frying pan and fry three or four sausages at a time, until browned. The heat need not be too high. Enjoy with a side salad. Cost: None of the ingredients are themselves particularly expensive and since this recipe should serve a group of four I think you’ll agree that this is rather good value for money. Indeed, the cost of eight of these divine beauties should be around £2 – far cheaper and healthier than any good quality meat sausage you’ll find. These look fantastic! I am loving this traditional foods series. 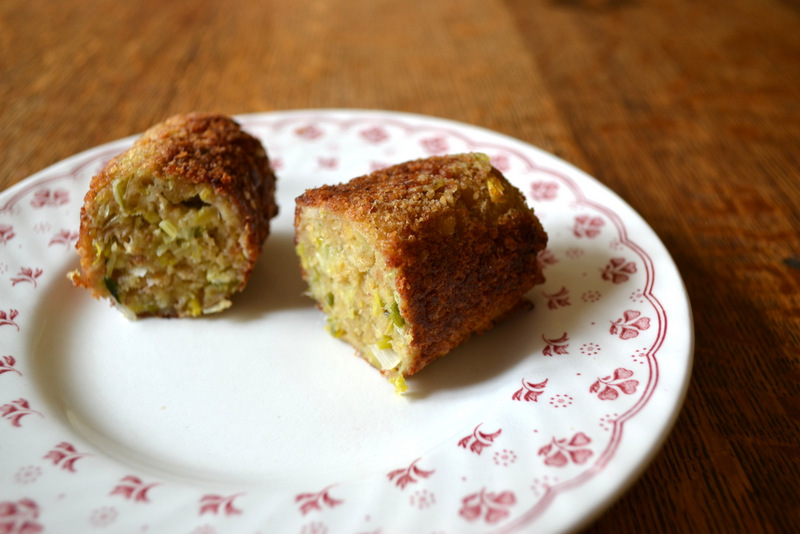 Glamorgan sausages are yummy and I never knew they were so simple to put together. How do you get them so uniformly formed and browned? Once, I enrolled a friend in a sushi eating contest without his consent. After much protesting, the man came in third place. Third place! I was so proud. I felt like I had raised a prize-winning hog or something! I didn’t know that there were leek-eating contests. Not raw, right? Are you going to make laverbread? I always wanted to taste it, but never got the chance . . . I think the times events are the hardest. Like the ones where you only have two minutes. I would do very well in an un-timed contest! And just where was this recipe all winter and early spring when I was drowning in leeks? I know, I know — it was in someone’s head in Wales. I am going to try this before the leek population winds down for the year. Thank you. Haha – very sorry! I hope you do, Sharyn. ooh those sound and look delicious! thanks for sharing! 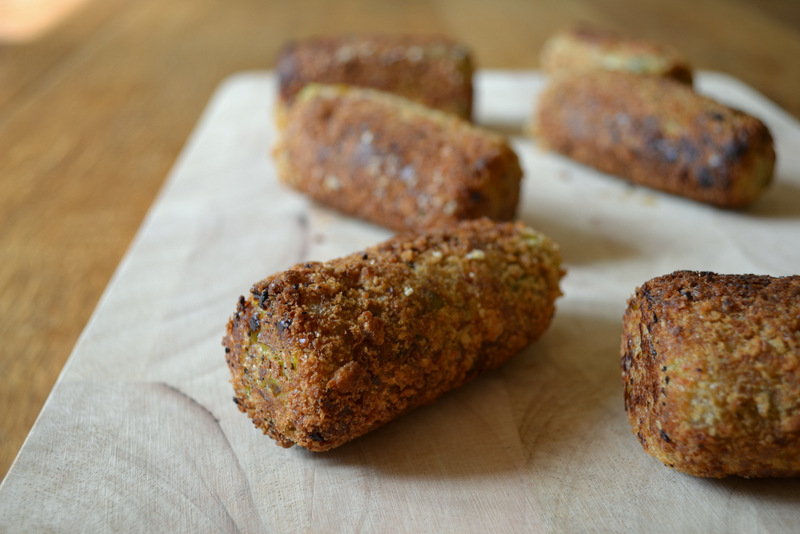 I LOVE Glamorgan sausages – I would say it must be the Welsh blood in me, but actually I think it’s just because they’re so good! 🙂 These look fantastic. I’m now so hungry and I just ate breakfast. 🙂 This is why I’m in love with your blog! You always make me hungry. I’ve never heard of these delightful little vegetarian sausages and I can’t wait to make them. Because I’m way over here in the US, if I can’t find the Caerphilly cheese, what sort of cheese would you suggest? I’m so looking forward to reading more about your delicious Welsh cuisine! I’d be really interested to see what else you do in this series. I must confess that, even next door in England, I’m pretty unfamiliar with Welsh food outside of laverbread and cawl cennin (and I think you introduced me to cawl cennin in the first place…). There’ll be another very soon! Perhaps I did! Check out my Welshcakes. These look great, never heard of anything quite like this, but worth trying. Thanks. Thanks, Shira! I do hope you do. My Auntie Ede used to make these (and Bara Brith) although she was from Mold, not Glamorgan! Have never attemtped them myself but think I could manage to get all the right ingredients here in Andalucía to make a good stab at them. Hope they turn out as well as yours – congratulations! Fantastic! Bara Brith is coming soon – two versions! I think you could make these, definitely! Thanks! WOW these look incredible, I will most definitely be preparing a vegan version of these! Wonderful! I have a couple of leeks left from winter storage and was just wondering what to do with them. The Welsh cookbook I just picked up adds a bit of chopped fresh herbs (parsley, thyme and “very little” sage” and a teaspoon of mustard powder. Thanks! 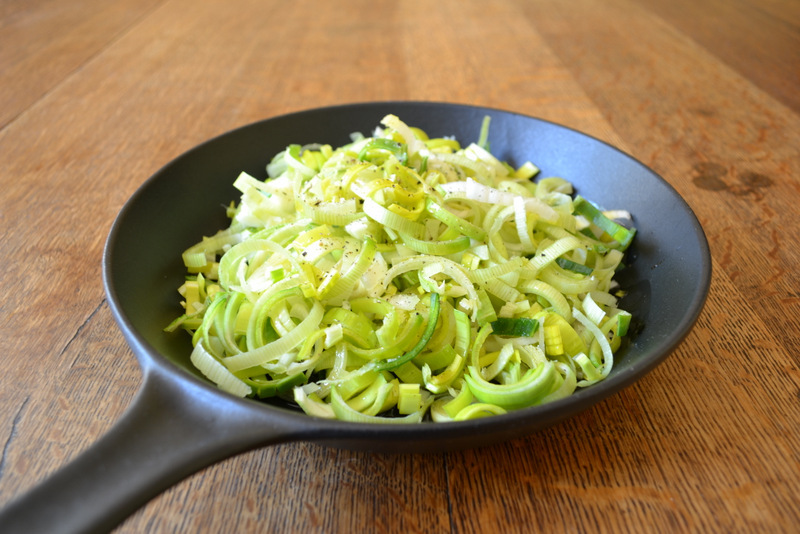 You could add those, but I think it would mask the flavour of the leeks and cheese – a waste, in my opinion. Remember, less is often more. Oh I will most certainly try these this weekend!! I would also be very happy to read some recipes involving seaweed. We have a lot of that around here but I wouldn’t know where to begin! There is one restaurant in town that slices it into fettucini noodles…..not too sure about that! Yes, please do! Maybe I’ll do laverbread, but I’m always a little uneasy about it! It;s very good for you though. Thanks, Vanesther! Give it a go! Oh my God, thanks for catching that! They look similar to cheese croquetas from Spain (minus the leeks). They look fantastic, you cannot go wrong with Fried cheese !! I must try them. Yes, they are. I intend to do those some time! Thanks! pasing this onto a friend who would love these! Thanks. I love these! I may need to find a substitute for the cheese here in the U.S. Thanks! Yes, that may prove difficult – I’m not sure of the cheese system over there. these look so tasty! I bet they make a nice snack too! Thanks! Oh yes and they are lovely on a bed of salad. Neither a cake nor a sausage maker am I!! But this I’ll try and replicate! They sound good to have and come at an opportune time! Well, Wales may not be England, but there is a Prince of Wales who, together with much of the world, is celebrating the life and work of a very special lady this weekend. Perchance Her Majesty Queen Elizabeth II would not quietly mind one of these either! Ma’am!! Oh you must – it’s not difficult at all. Haha – we definitely aren’t in England, I’m glad you realise :D.
At first, I was put off by the vegetarian, but these look wonderful! I will try this. Thanks Frugal. You’re always put off by the vegetarian, but these were never intended to be proper sausages… They are amazing. Perhaps you could! You’ll definitely get the hang of it – read some blogs about food photography! You need to photograph somewhere that has some natural light. I don’t photograph in my kitchen. Oooo … These reminded me of crouquettes, a favourite of mine. These would be amazing with a beer, no? I shall be making those soon, never fear, Aimee! Oh yes, they would suit a beer just fine. I’m crazy about leeks! I’ll be making these soon. Oh yes, do – they are wonderful. I think these look wonderful. We have a few vegetarian friends who would especially adore them, especially made with our homemade perennial leeks which grow like a weed in our garden! Thanks, Celia! Oh my! I want some of your leeks :D. Hmm, laverbread… I’ve never been too keen on it. Perhaps I’ll give it a go. Maybe I’ll even gather the seaweed myself… we’ll have to see about it though. I love the idea of these vegetarian sausages and they seem simple to make! Bookmarking the recipe- will have to see what cheese I can use to substitute the one you mentioned. Thanks, Shumaila! I’m sure most fairly creamy cheeses would work. Wow … I remember having those as a kid (actually in Glamorganshire) … I’d forgotten all about them! So simple, but very tasty! Thanks! they really are packed full of flavour. I’ve never even heard of these! A definite to-make. Oh yes you must. That’s the idea of this series – spreading the word. 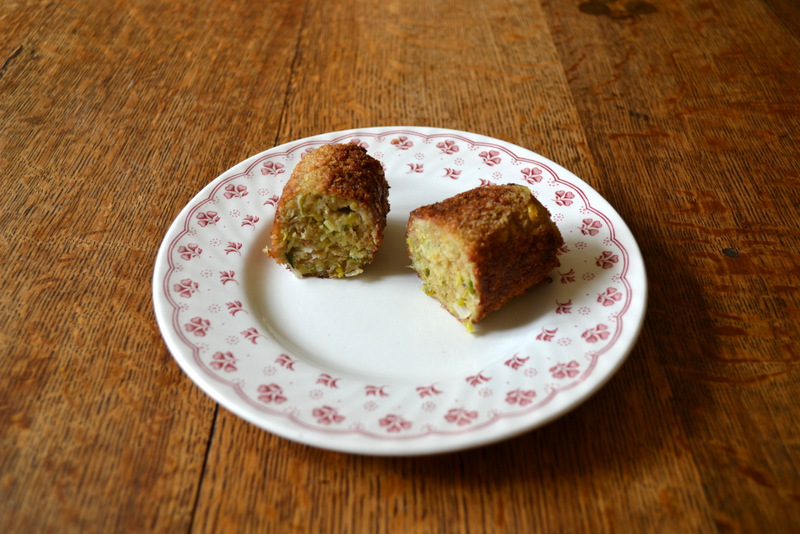 These look wonderful, like a Dutch croquette but much less work (and much less meat!). Indeed! I shall be doing traditional potato croquettes soon I expect. These look delicious and perfect for my vegetarian son. My daughter-in-law has developed a wonderful veggie fry up recipe for him using purchased veggie sausage – we will both want to try this for sure. Also nice to note lots of traditional dishes rely on simple flavor combinations. Thanks! Definitely try it – they’re so delicious! Exactly. I adore simple flavour combinations. Exactly. though one of those would be fun. So. I just read through your tradition series.. and I’m so excited about it. We have a friend from Whales who is moving away and these all look like the makings of a perfect going away party! Whoo! Leeks are so good! I hope you like them! Thanks for the award. I’m afraid We can’t get hold of Caerphilly cheese in Belgium … What cheese would you advise as a substitute? That’s a shame – something crumbly, milky and medium in flavour. You could technically use any cheese – though nothing too melty like mozzarella.